On snowy winter days, when it is good to stay close to home, I enjoy making dinner in the Crockpot. One of our favorite's is spaghetti; our kids were raised on this recipe and it is one of picky-picky husbands favorites. The thick and hearty sauce and tender meatballs really need a solid six hours or more in the slow cooker, so don't be tempted to rush it. I love the way my kitchen smells when I make this sauce. Mix all of the meatball ingredients and shape into walnut size meatballs. Bake in a 350 oven for 15 minutes then drain well before adding to sauce. Saute the onions, garlic and carrots in the olive oil until they are very aromatic (they don't need to be cooked through). Add the rest of the sauce ingredients and bring to a boil. Put the sauce in the Crockpot and add the baked meatballs. Cook on high for 6 hours. The last couple of hours, leave the slow cooker lid open just a crack so the sauce will reduce and thicken. Serve over spaghetti noodles. NOTE: If you like mushrooms, add them the last hour of cooking. Nothing like a yummy plate of spaghetti on a cold day! The snow looks beautiful! Bravo to your husband for shoveling all that snow by hand! He deserves a medal for that! Wow! That is an incredible amount of snow! I've never seen that much snow in person but I would like to! I'm hoping for a good snow here in West Virginia sometime soon. I'm glad I don't live where it snows that much. I do not like snow very much. Nice looking spaghetti and meatballs. Thanks. Love this recipe and will definitely try it. Never made spaghetti and meatballs in the slow cooker. Love the sunset picture...the snow....I'm glad it is by you and that you love snow. I don't like snow at all!!! Our winter has been pretty mild so far but last night we had snow and the temps dropped. Everything looks pristine and pretty this morning. Someday I'd like to visit Alaska! I saw the snow fall in Alaska on tv! I'm definitely not gonna complain about snow after seeing yours! 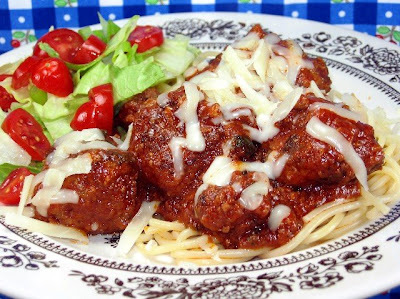 Your spaghetti and meatballs look terrific! Yes, your area has make the national news. We have been amazed at all the snow in your area. Here in Alabama, we get one inches and we think we have snow. wowsa! i've only ever seen alaska in the summer (which is SO beautiful), what a winter! it is definitely beautiful though. love this dish!